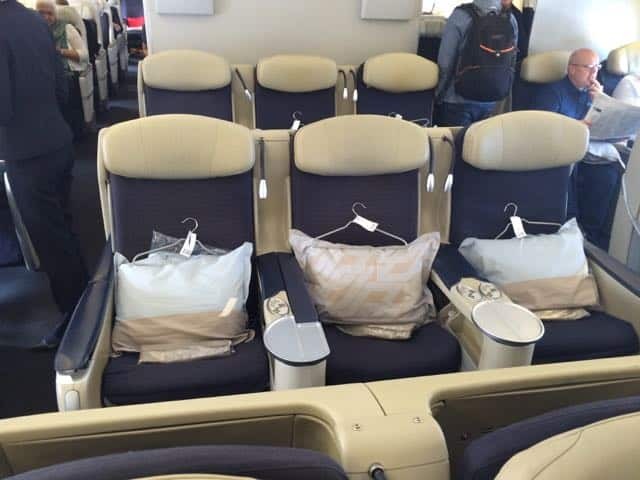 Back in March, Air France had a limited sale on flights from Houston to Istanbul in Premium Economy class. A friend and I each booked a round trip ticket for $631. Air France is a partner of Alaska Airlines, so it fit in with my plan to get Gold 75k status this year. This also wouldn’t be “just” a mileage run as I had wanted to go to Istanbul and we would be spending three nights in the city. 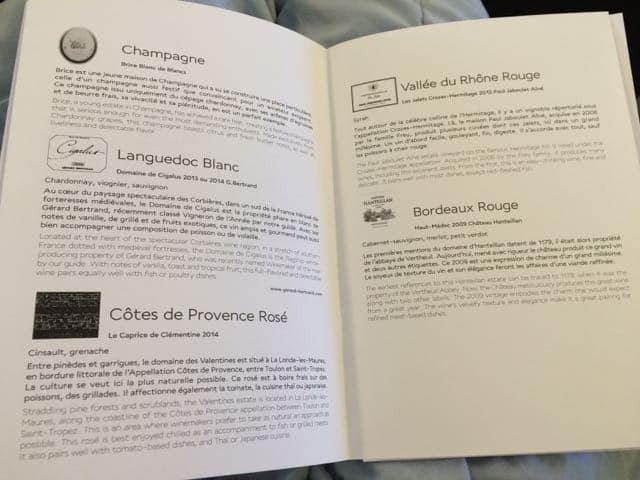 This first section is how I got to Istanbul in Air France 777 Business Class. The first hurdle was to get to Houston, the departure city for the trip. Alaska flies once a day to Houston, getting in at 4:40pm. The fight to Paris and on to Istanbul leaves at 4:05pm. 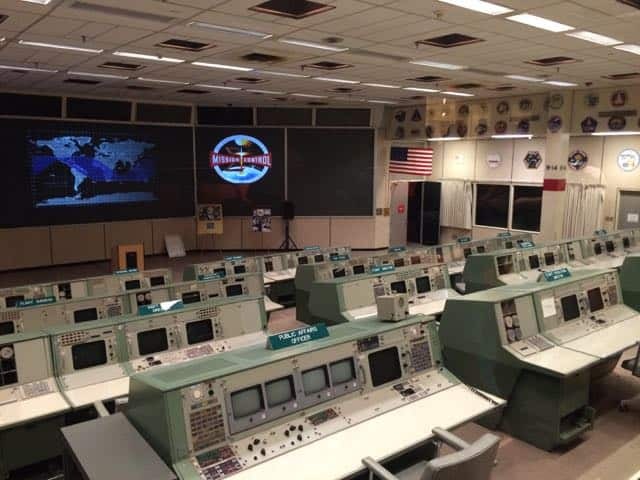 So I would need to spend a night in Houston on the way out. 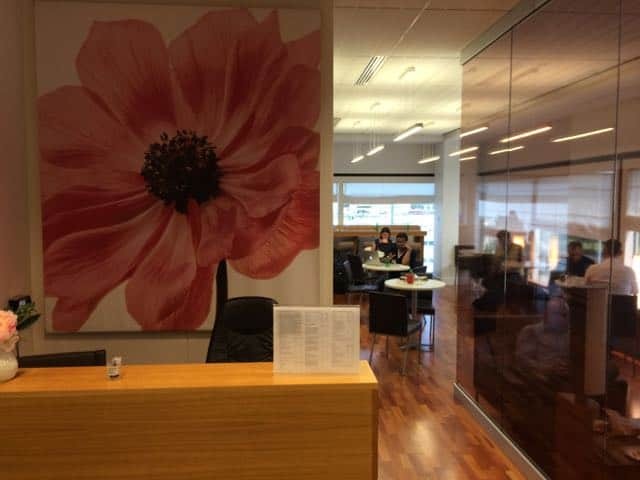 I booked a flight which ended up only costing $270 RT after using Alaska’s Price Guarantee. As I am a Hyatt Diamond member (hoping to keep the status for next year), I found a deal at the Hyatt Regency Houston through the Hyatt Best Rate Guarantee. The Hyatt Regency Houston is a typical business hotel. You can read my review of it here. I was told by a former Houston resident that I had to go to Ninfa’s on Navigation, where the Fajita was invented. Sure enough, the food was delicious. 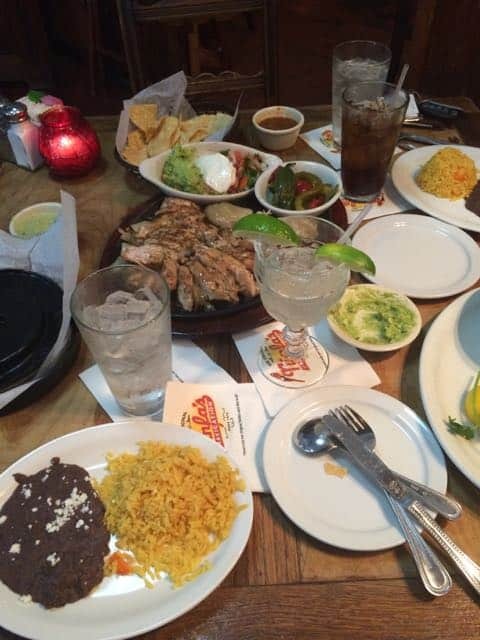 Houston is known for Tex-Mex and the meal lived up to the reputation. Ninfa’s motto is “The best Mexican food in Texas since Texas was in Mexico.” Apparently there are other Ninfa locations, but this is the original and the only “real” Ninfa’s. I ate way more than I should and still had plenty of left overs. 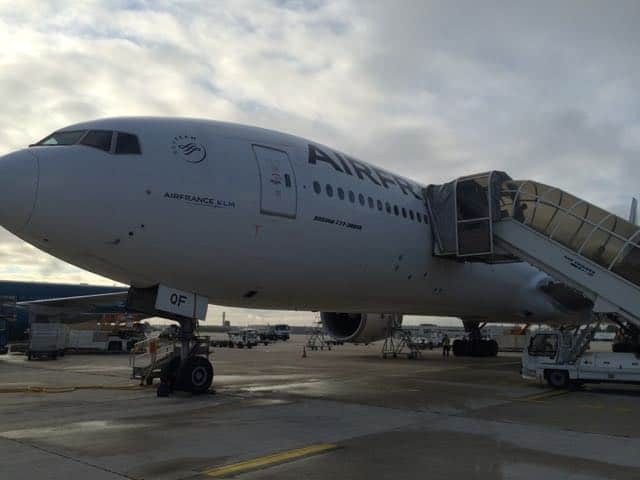 At 30 hours before departure you can check in for your Air France flight online. 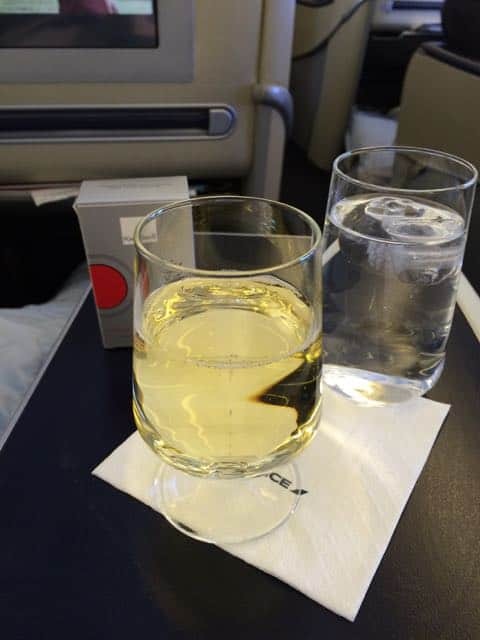 At that time, I was offered an upgrade from Premium Economy to Business for $248. Doing some homework ahead of time, I knew that my plane was the old 777 four class configuration with the angled flat seats. Unsure if I would be offered the upgrade on the way home, I decided to go for it. Upon arrival at the airport I was able to use the SkyPriority line for check in as well as security and boarding. 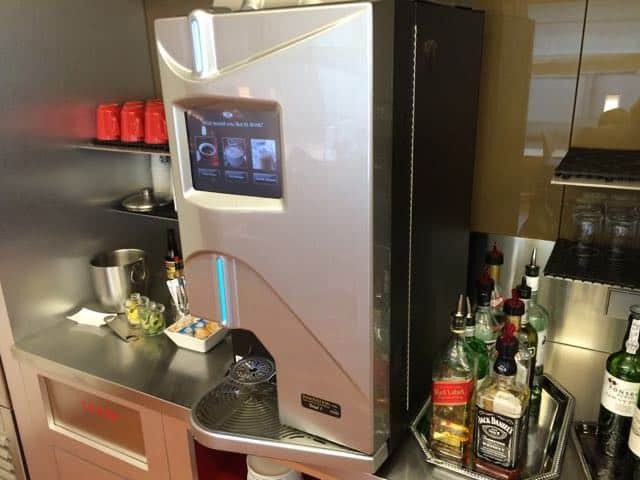 This would have been the same benefit for Premium Economy. It did cut down on wait times in line which was a nice bonus. 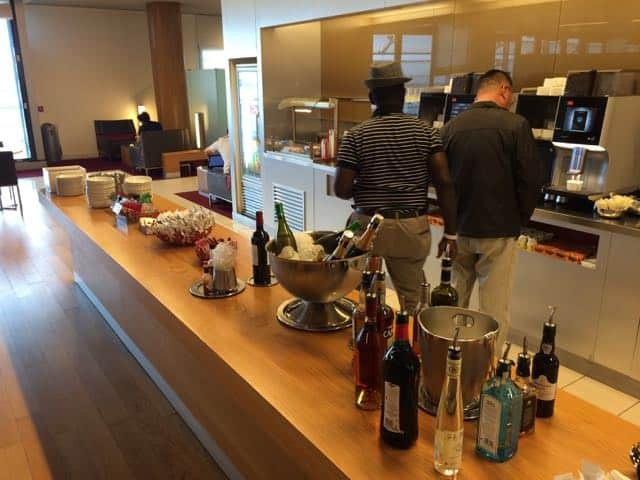 With my Business Class ticket I was able to visit the Air France lounge at IAH (not available for Premium Economy). 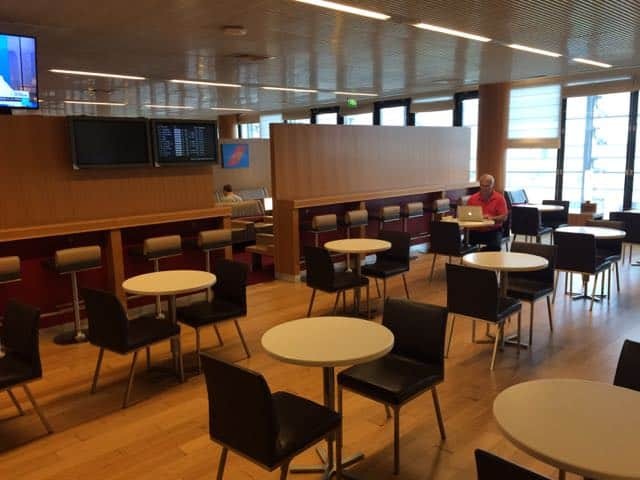 The lounge was at the opposite end of the terminal from where the plane boarded and, somewhat surprisingly to me, was separate from the KLM lounge (KLM and Air France having joint loyalty programs). From the outside the lounge looks very sketchy; just a solid door with a small sign. Inside it was a bit better however there was not enough seating for everyone. People were actually sitting on the floor. 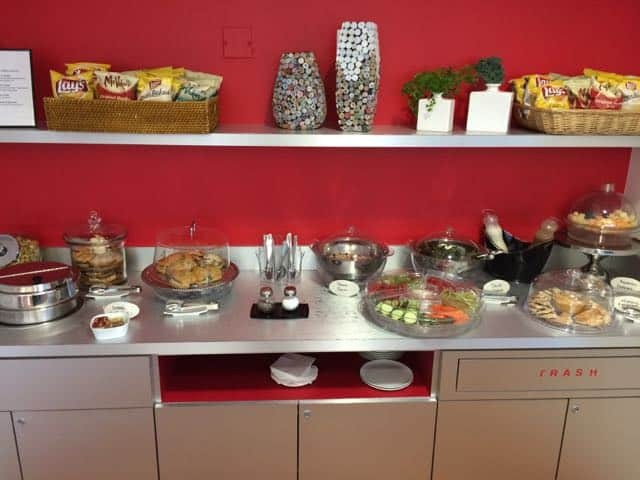 There were self serve beverages, a couple of salad options, cheese, sandwiches, and one soup. 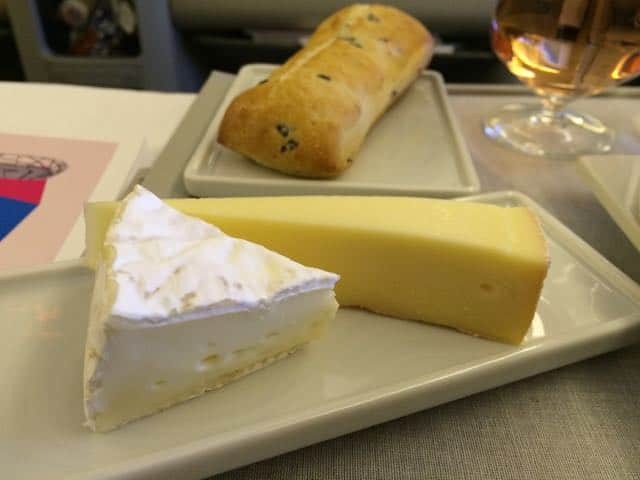 A nice touch was just before boarding staff came around with cheesecake bites. 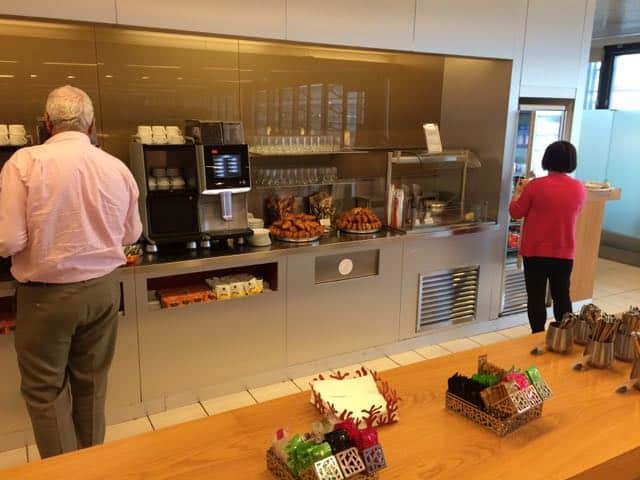 Overall the staff was very attentive. Overall not a bad place to spend an hour or so waiting for your flight. I was seated in seat 10G, an aisle seat in the middle section. The Business Class of the older 777 is a 2-3-2 layout and the cabin is split into two sections. The front section is just behind First Class and only has two rows of seats. The second section has rows 5-12 and feels much more cavernous. In my opinion, the best seats would be 3E or 3G. Row 4 and 5 are very close to the galley where staff and passengers congregate so it would be noisy. 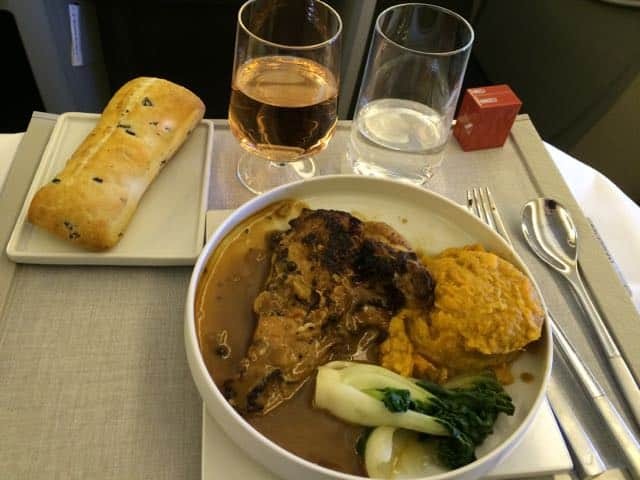 This will all be ancient history shortly as Air France has plans to refurbish their entire Air France 777 Business Class. The seats themselves were quite comfortable despite not being completely lay flat. 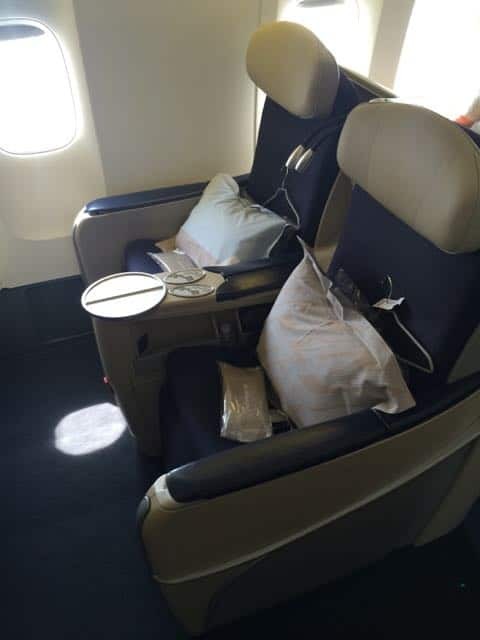 They are highly maneuverable so you can customize your comfort, much like the AA Business Class seats I flew to Beijing. One feature I especially liked was the built in massage; sadly it automatically goes off after about 15 minutes. 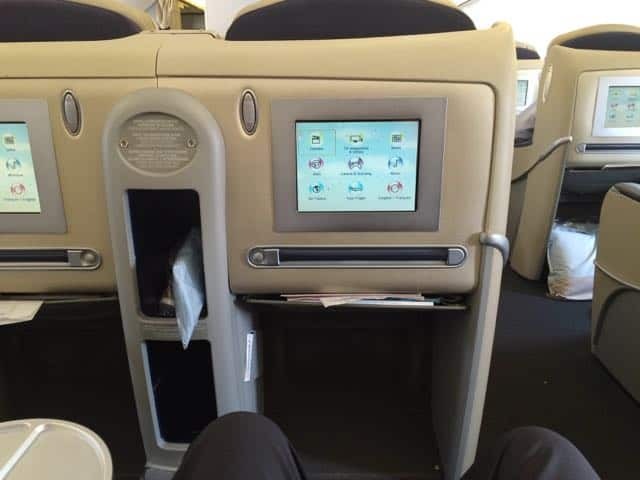 A large screen is fixed in place to the seat back ahead of you. They are well worn and clearly need to be replaced (which is in the works). In fact, my armrest was held together with masking tape. Every passenger in Business was provided with a hanger at their seat for their jacket. 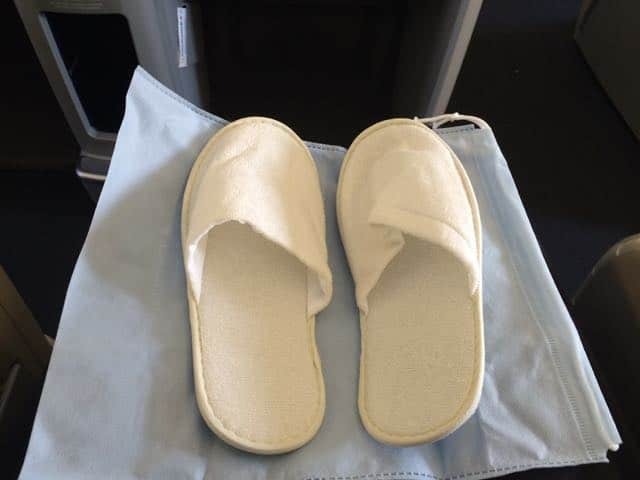 Also on the seat was a sealed down blanket, large pillow and slippers (including a handy shoe bag to store your shoes in the overhead bin). 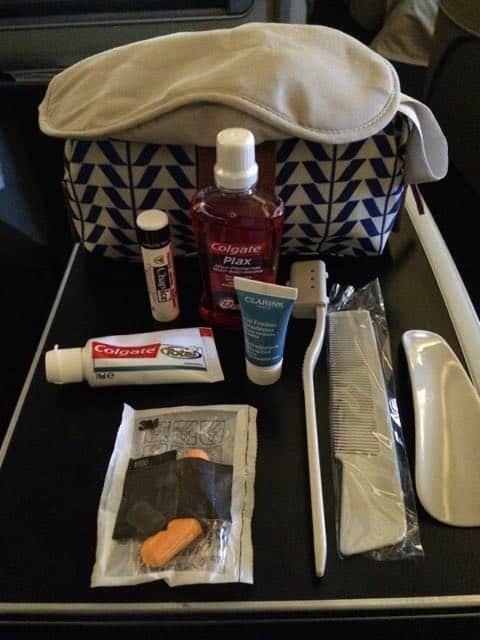 Shortly before take off the flight attendant passed out amenity kits which were quite high quality. 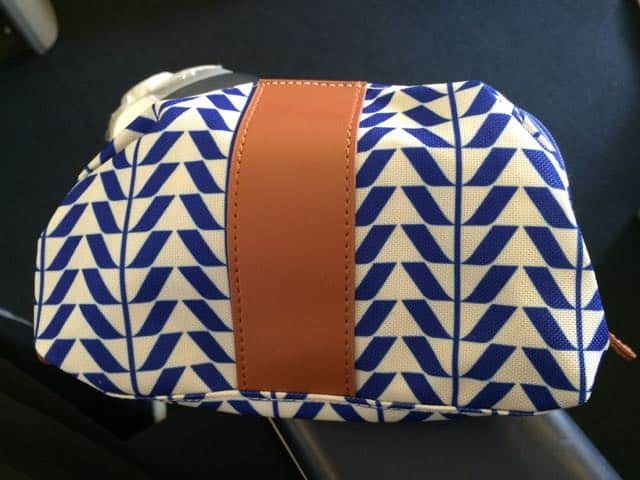 I ended up using mine for the rest of the flights and probably will for future flights as well. 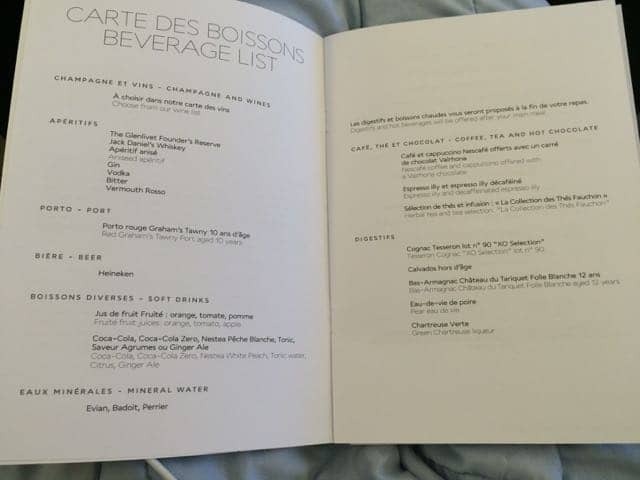 I had read mixed reviews on the service on Air France, but on this flight the Business cabin staff was mostly on point. 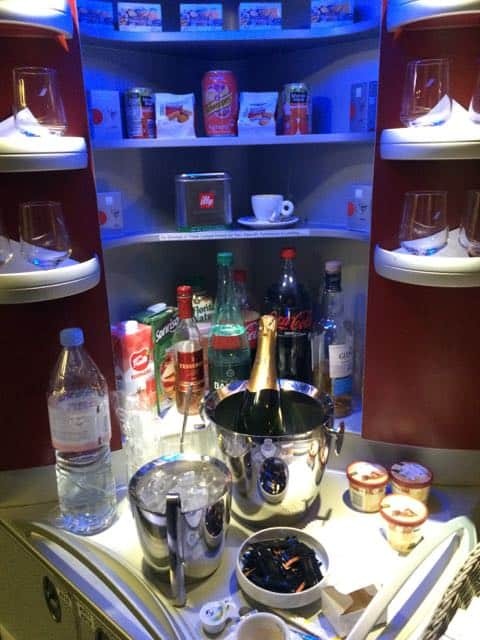 They must have come through the cabin with the drink cart at least 6 or 7 times. 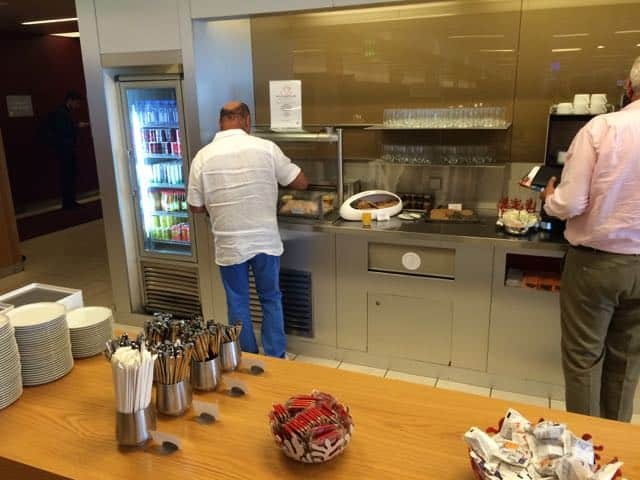 There was also an open bar in the galley that included snacks and Haggen Daz, as well as an espresso machine. 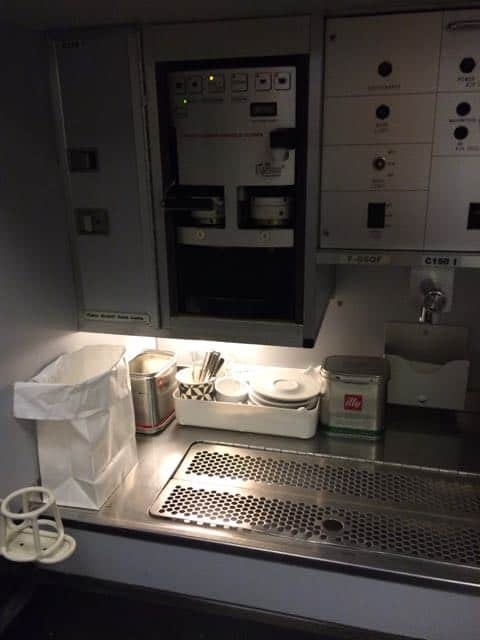 One of the attendants serving my aisle seemed to be in training. She skipped me when handing out the amuse bouche and forgot to get me a drink I ordered. The rest of the staff were flawless. 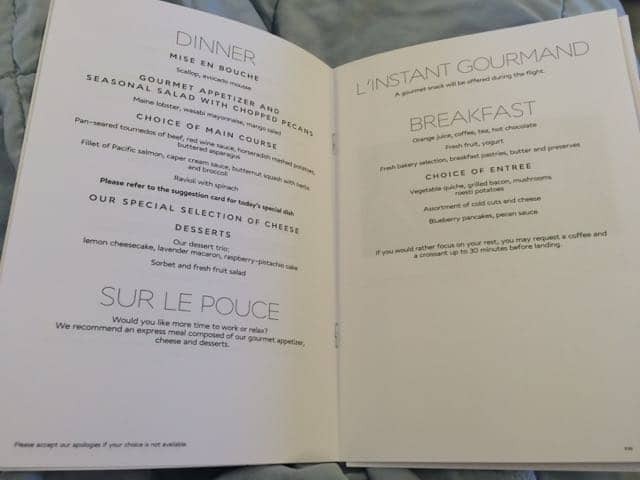 The food was very tasty with the one exception being the dinner main dish. I had the “daily special” chicken and was not impressed with the quality. The sides and all other courses (minus the amuse bouche that I didn’t receive) were all wonderful, fresh, and flavorful. 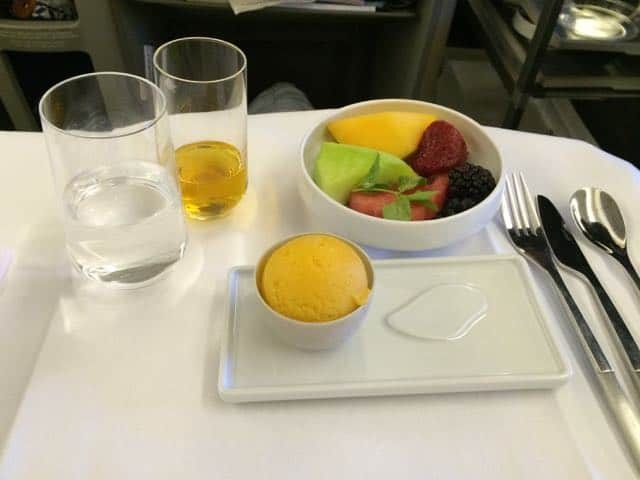 I especially liked the mango sorbet and fruit plate for dessert. Probably the best airplane food I have ever had. And to be expected, great wine that kept flowing! 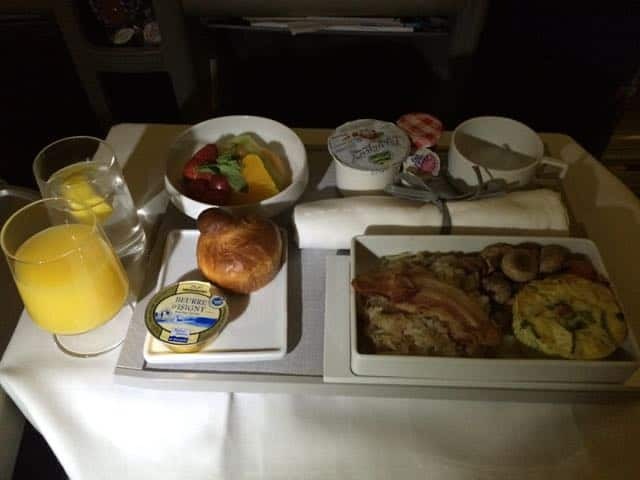 I was able to sleep a few hours and breakfast was served about 90 minutes before landing. I only had a 90 minute layover in Paris so I headed straight to the Air France Salon in 2E. The staff was less than friendly; I was asked “What do you want” after I handed over my boarding passes. I replied that I would like to get in to the lounge (duh). She said my ticket was for Premium Economy, to which I replied I had upgraded to Business. After a bit of back and forth, she let me in. I had about 10 minutes before boarding time so I grabbed some water and looked around. It was a big lounge but nothing particularly stood out to me about it. The flight from CDG-IST was on a A320 which had the least amount of legroom I have ever had on a flight. 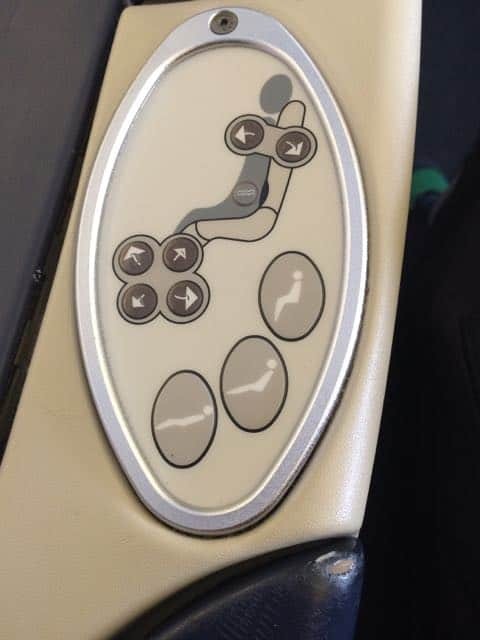 All of the seats on the Air France flight are exactly the same. Business Class just means that you don’t have anyone in the middle seat (so have more space). Economy Flex (Premium Economy for flights within Europe) just meant that you got to sit closer to the front of the plane. 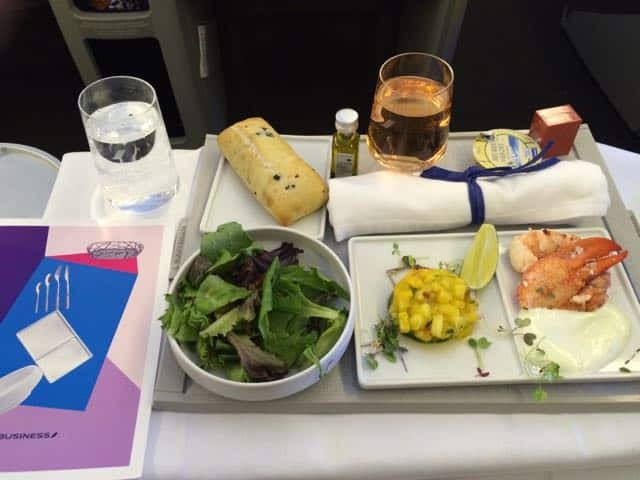 I was served a meal on the flight which was okay. By that point in my travels I was just wanting to get to Turkey.